Kim Fowley had been bouncing around the edges of the Los Angeles music scene for a few years when he scored a hit single in 1960 with "Alley Oop," an odd little novelty single credited to the Hollywood Argyles, with Fowley talking hipster style about the once popular comic strip caveman over a simple, clanking backing track. "Alley Oop" convinced Fowley that the public had a taste for the eccentric and gimmicky if it was packed right, and ever since, the man has been delivering the eccentric and gimmicky as a songwriter, producer and occasional recording artist on a regular basis. 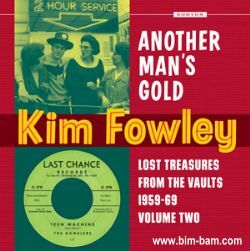 The cultural archivists at Norton Records have paired up with Fowley to collect some of the more interesting items from his career in the music biz, and Another Man's Gold: Lost Treasure from The Vaults 1959-69: Vol. 2 pulls together 16 oddball single sides Fowley produced during his heyday. Another Man's Gold isn't quite as aggressively quirky as its companion volume One Man's Garbage (which includes Althea & the Memories' inarguably amazing "Worst Record Ever Made"), but that's not to say Fowley doesn't dig up some prize winners here, most notably a head-scratching comedy routine by the Players called "Memories of a High School Bride," the "Johnny B. Goode" parody/ripoff "Surfer's Rule" by the Rituals, and a pair of hilariously dated topical items, "Long Hair, Unsquare Dude Called Jack" by the Hollywood Argyles and Fowley's own "Big Sur, Bear Mountain, Ciro's, Flip Side Protest Song," a folk-rock experiment that goofs on protest numbers while name dropping Bob Dylan and the Byrds. Of course, one of the reasons Fowley was able to get away with cutting crazy stuff like this for so long is that he would occasionally score a hit, and if there aren't any here, a bunch of the songs on this disc are pretty great, such as the killer instrumentals "Ghost Train" by the Renegades and "Teen Machine" by the Gamblers, as well as a couple solid girl group numbers in "Gone But Not Forgotten" by the Cover Girls and "Eleventh Commandment of Love" by Bonnie & the Treasures. And even when he was aiming for weirdness, Fowley's knack for a hook and a witty lyric meant he was better at it than most of his peers, and though Another Man's Gold isn't as strong as its sibling collection, it confirms that the man's archive doubtless merits greater investigation (and his liner notes suggest this man ought to try writing his autobiography one of these days, which ought to be one crazed read if it ever happens). Thanks again for this, a great addition to my growing Fowley stash. I do believe that theres a Kim Fowley bio movie due ou any day soon. thanx for all the Fowley stuff, what a great blog!